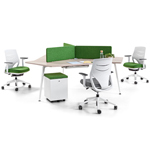 Inspired by the Nordic style Prisma is a unique desking system that hides a lot of complexity in its structure. The junction of its legs, in a pyramidal shape with a compact aspect, which appears as one single piece, was a challenge in its design and manufacture process. The Prisma system comes with a range of operative and meeting desks which provide maximum versatility for all types of spaces and projects.